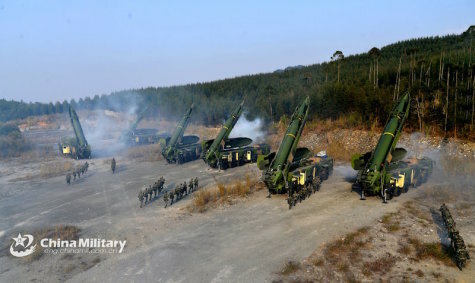 China Central Television recently reported a training exercise staged by a missile brigade of the PLA Rocket Force, raising widespread concern. The video clips revealed multiple suspected “DF-10A” long-range land-based cruise missiles were launched in rapid succession and hit the targets accurately during the training. Through some details revealed in the video clips, the general performance and operational mode of the “DF-10A” cruise missile can be found. The Singapore-based Lianhe Zaobao reported on Sunday that the video clips published by China Central Television showed scenes in which multiple "DF-10A" cruise missiles were launched simultaneously and knocked down a building. It was reported that if a missile brigade has six missile-launching battalions, and is equipped with more than 100missile launchers with each carrying three missiles, theoretically, it is possible for the brigade to fire up to 200 to 300 "DF-10A" cruise missiles at a time, covering an operational range of 2600 kilometers. Another 200 to 300 cruise missiles can be launched simultaneously after the redeployment and impact assessment. Taiwan's United Daily News also reported that the “DF-10” is said to be one of the best long-range land-based cruise missiles. It is generally believed that the ground-launched “DF-10” has an operational range of more than 1,000 kilometers, and the range of the air-launched one is even farther. As of why using a cruise missile to hit a building instead of striking such targets as tunnels and castles, the United Daily News quoted the Chinese analysts’ words, "It is related to Taiwan. Everyone knows." However, an anonymous military expert from the Chinese mainland said that the reason for firing at a building may not be simply for deterrence purposes. In general, the formulation of the target must match the guidance mode of the missile. In the final stage of a cruising missile, the scene matching guidance mode is usually adopted, and the target must have obvious appearance features and accurate size to meet the accuracy requirement. Judging from the video footage, this seven-story building was about 20 meters high and 50 meters long, which might be the typical target of the “DF-10”. China Central Television's video footage showed "DF-10A" missile launchers fired multiple cruise missiles simultaneously. Was China's missiles salvo for show? According to the experts, using cruise missiles to strike targets effectively needs a certain amount, which means in real battles, the number of missiles must reach a certain amount in order to achieve better destruction effect. While in this case, launching missiles salvo can be completed as quick as possible, reducing exposure time and improving survival probability. In addition, a number of cruise missiles should reach the target synchronously in a short time so as to increase the defense penetration probability and enhance the attack suddenness. Missile salvo is designed to achieve this effect. In fact, salvo is not a difficult thing for the missile force. The hard part is to let the missiles launched at different times and different locations arrive at the target area synchronously, so as to achieve the attack suddenness. Mixed use of cruise missiles and ballistic missiles? In the video clips released by China Central Television, the “DF-16” short-range ballistic missiles were deployed at a place not too far from the launch site of the “DF-10” cruise missile. Some outsiders believed that this indicates the cruise missiles and ballistic missiles have been mixed into groups. However, military experts believed that the salvo is likely to be for demonstration purposes only. In real battles, ballistic missiles and cruise missiles can play their respective advantages in striking different targets or different parts of the same target, thus further increasing the striking effect and penetration probability, but it may not be used in the same site. For example, some air force bases in eastern Taiwan have established underground caverns. Those bases are located in the mountains and therefore it is not easy to use a ballistic missile to hit the doors. On the contrary, cruise missiles can launch precise attacks on the gates as they can turn around easily. Ballistic missiles are able to emit the penetrating bomb or cluster bomb against the bunkers or runways. The coordinated use of cruise missiles and ballistic missiles can indeed increase the probability of defense penetration. But They need to reach the target area at the same time. The "DF-10" has a slow speed, which means it has to be launched first, and ballistic missiles will be launched after a certain period of time. After the launch of cruise missiles, the position is likely to be exposed, which makes the ballistic missiles deployed in adjacent areas more dangerous. Therefore, the best way is to deploy the two kinds of missiles at different launch sites far apart and launch them at a well-coordinated time.